It consists of 1 pt. #471, 1.5 pt. #472 and 1 qt. #473 casserole compatible bowls. 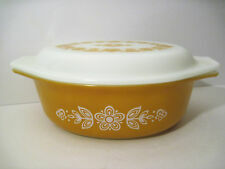 The bowls are all marked "TRADE MARK PYREX Made in U.S.A. OVENWARE". The bowls and lids are in excellent condition. 2 PC CULVER LTD ANTIGUA BAR WARE COCKTAIL SMALL GLASSWARE Gold. Gold design. 2 3/4" tall. Circa 1965 - 1979. Imperial Glass-Ohio. Very clean and appears to have never been used. Gold intact on outer and inner rim. PROVENANCE: Mood Indigo, New York, NY. Royal Haeger gold tweed glaze double handled urn. 7 1/2” x 8 1/2”. SUMMARY: Venetian Mid-Century cabinet sized pillow vase in the ‘cordonato d’oro’ décor, attrib. Barovier & Toso, circa 1950s. Aventurine, Barovier & Toso, Cabinet, Clear, Cordonato d'oro, Ercole Barovier, Gold, Murano, Vase. Condition : Punch bowl has a chip on the back side. We have 2 of these in different condition. More GOOSEBERRY coming soon ! VINTAGE SET OF 3 HIGH BALL GLASSES! So very nice looks to have hardly have been used ?. More GOOSEBERRY coming soon ! 3pc Vintage Marigold Carnival Glass Console Bowl + 2 Candle Stick Holders,Maker? I don't know who made them, look nice together. Each candlestick stands 7" tall, base is 4" wide. One candlestick has a tiny flea bite on corner top(see last pic). Indiana estate find. SEE ALL MY PICTURES. 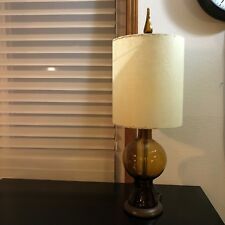 Blenko Art Glass Table Lamp Vtg Includes: lamp, with original harp, shade & finial Style: Mid Century Modern Color: Amber Height (with finial): 30.25” Lamp diameter: 8.5” Designer: Don Shepherd Some wear to base consistent with use and age. Otherwise in excellent condition. 2 3/4" tall. Gorgeous retro glasses.Gold design. Circa 1965-1979. Imperial Glass-Ohio. Little to no wear to gold on outside of glass. Slight wear to gold on interior rim. PROVENANCE: Mood Indigo, New York, NY. With squares of white, gold and black each with a starburst in the center. This is a beautiful piece of mid century dinnerware made by Inland Glass Co. The edge with the decorations is 1" wide. It is clear glass in an oval shape with the grooved ribs and bowl for serving. Here we have a super bulbous vase, 2 small children at the beach, a little boy flying a kite on the other side, signed on the base, 5 1/2" tall, 7" wide ! This is a beautiful Gouda Holland, modern "Streamlined" black art pottery bowl set, with 14K gold pin stripes. This is a very rare complete set, which is in superb condition. HEISEY--4-PART DIVIDED DISH--LOTS OF GOLD--ROSES--EXCELLENT--BUY IT NOW! No Wear to The Gold. Absolute Mint Condition. It is ivory with gold marbling and raised Greek key-like design. from the Grecian COLLECTION, circa 1957-1958. The vase bottom is marked WITH A RAISED "McCoy 455" USA AND. The COFFEE / TEA POT. 6 1/2" tall by 5" wide across the top rim. Beautiful 6 piece set of California Originals pottery from the 1950s-1960s. I inherited this piece. Color is subtle (kind of light peach or cream)with gold details and will match any table decor. Very good 1950's condition. This decanter is 12" tall and 3 1/2 tapering round. This set has destinction on any level. It is the old Ada Clay. Thumb Print Design. 10 1/4" Wide x 4 3/4" Tall. 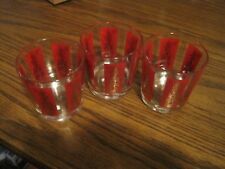 Vintage Federal Glass Co. Caddy set of tumbler, blown dining glasses. Has been in the family since original purchase in 1963. Cardboard box that is pictured with details is not included. On the glasses and caddy. Set of 8 22k gold trimmed glasses. 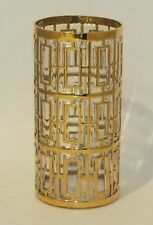 7 are a matching set with one small chip as pictured. The eighth glass is from same company and trimmed in 23k gold as well, but it is a starburst pattern. 12oz glasses. Gorgeous Mid Century design.